FILE - Russian celebrity TV host Ksenia Sobchak, who is challenging Russian President Vladimir Putin in the March 18 presidential election, speaks during an interview with the Associated Press in Moscow, Feb. 1, 2018. Russian presidential hopeful Ksenia Sobchak, a Russian TV celebrity and socialite, told VOA the rumors are true: If her father’s one time political protege, President Vladimir Putin, were guaranteed a personally safe exit from public life, he would willingly retire from politics. Sobchak, 36, whose candidacy has been questioned by opposition activists and political observers who suspect her campaign is a Kremlin ploy to boost turnout and help Putin’s bid for another six-year term, is not the first to make this claim. Alexei Navalny, the charismatic anticorruption crusader who has built a national following by railing against endemic corruption, made a similar observation several months ago. After being barred from seeking office by what supporters have long called politically motivated criminal charges, Navalny made the claim independent of any direct ties to Putin’s inner circle. Sobchak, however, is the first person to base the observation on personal insights into Putin’s private life. 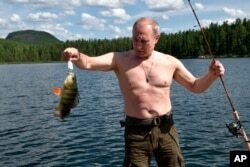 FILE - In this photo released by Kremlin press service on Aug. 5, 2017, Russian President Vladimir Putin holds a fish he caught while fishing during a mini-break in the Siberian Tyva region. Asked whether a bloodless succession could be guaranteed without Putin's wealthy and powerful allies remaining in power, she said the president's departure would require a politically strategic transition. “Our job is to demonstrate that we want regime change, but we don’t want vengeance for the years that already happened,” Sobchak said, adding that building a new Russian political era on retribution would only “scare the regime even more and Putin will never leave." “Not just to give him guarantees, but show that Russia can develop evolutionarily and is ready for political race through elections ... [where] Putin doesn’t have to worry that the courts—the very courts he has turned into puppet courts—will prosecute him,” she said. FILE - Russian celebrity TV host Ksenia Sobchak, will be be on the ballot for the Russian presidential election in March, smiles after receiving flowers at a meeting of her supporters in Moscow, Dec. 23, 2017. Attending several high-profile events in Washington this week, Sobchak countered skeptics, including fellow opposition figures such as Navalny, calling her political ambitions genuine and slated to continue well beyond the upcoming March 18 polls. Speaking at the Center for Strategic and International Studies on Tuesday, Sobchak indicated that, among other things, she planned to meet with administration officials about U.S. economic sanctions imposed on Russia in recent years. “The mission is to demonstrate that Russia is not Putin, that we’re ready for cooperation, and that there are a lot of people in Russia who want the U.S.-Russia relations to be improved and that we don’t view the United States as our enemy,” she said. Washington first hit Moscow with asset freezes and travel bans in 2014, following Russia’s annexation of Ukraine’s Crimean Peninsula and the outbreak of fighting between government forces and Russia-backed separatists in eastern Ukraine. Later measures were in response to U.S. intelligence findings that Russia engaged in a hacking and propaganda campaign to influence the 2016 U.S. presidential election. Those sanctions have continued into Donald Trump’s presidency, despite his calls for better relations with Moscow. Declaring her support for U.S. sanctions specifically targeting “corrupt individuals” in Russia, Sobchak criticized the recently circulated “Kremlin list,” a Treasury-issued registry of 210 Russians identified as close to Putin, calling it “basically a Yellow Pages listing” of Russia’s wealthiest civilians and government officials. Although Kremlin critics such as Navalny cheered the list as a positive development, Putin stalwarts roundly condemned it as a “hostile act,” while neutral Kremlin watchers such as Konstantin von Eggert said the list was so vast that it rendered the roles of competing interest groups inside and outside the Kremlin irrelevant. Neither Moscow nor Washington’s political leadership, she said, can be expected to break the current diplomatic impasse, which has been most pronounced by dueling foreign agent registration laws that Sobchak says she opposes. Asked whether she was instructed by the Kremlin to act as a back channel to improve relations with Washington, Sobchak was dismissive. As one of six candidates scheduled to appear on the ballot, Sobchak is best known for her celebrity persona and TV appearances. Her father, Anatoly Sobchak, was the late mayor of St. Petersburg who brought Putin, then an unknown KGB officer, to work in the city government, where the two developed a close friendship. Sobchak, who has routinely denied claims that she is personally close to Putin, whom she has known since childhood, described her widely reported 2017 private meeting with the president—during which she notified him of her decision to run—as part of an interview she was conducting for a documentary film she was producing. Kremlin critics say most of the other candidates are window dressing in a vote Putin is certain to win in Russia’s tightly controlled political environment. Svetlana Cunningham translated from Russian. Edited by Pete Cobus. This story originated in VOA's Russian Service.